The Hook: If magical objects existed in our reality, someone’s got to collect them, right? What would that be like? 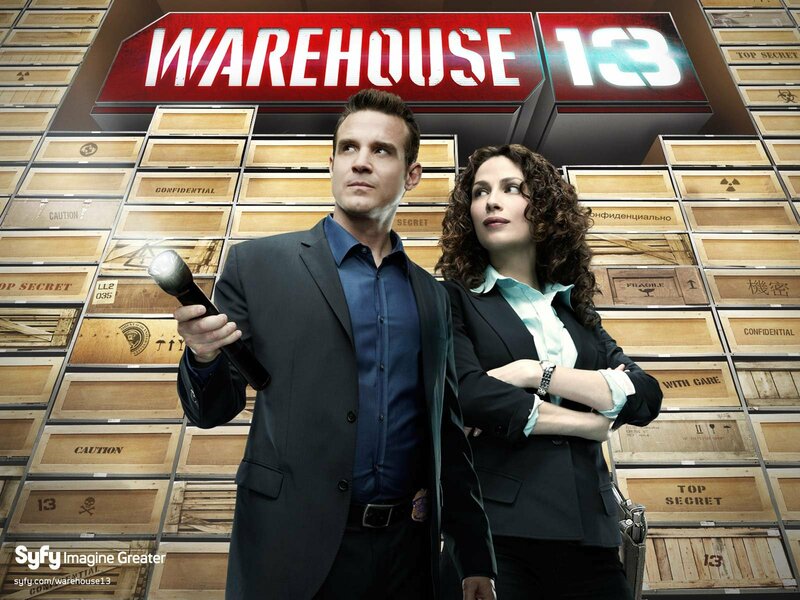 Warehouse 13 is one of those handful of episodes that I’ve actually followed from Pilot to series finale in “almost” real-time. I watched them OnDemand for their first two seasons, then migrated to Hulu, then waited for the last half of Season 4 to load to Hulu (since I missed one or two episodes on Hulu so, you know, I couldn’t watch the next because, well, you know). And I’ve been patiently, patiently, waiting for Season 5 with no such luck so, well, you know the rest. Back to the point. Being one of the handful of shows that I kept up with, I was so sad to see them on the chopping block last year, especially with my other favorite Syfy show–Eureka–on the chopping block as well. So. Sad. And then I realized. Since this show had a weird filming schedule, I never really blogged about it. And it was also during a time when I wasn’t on my A-game with blogging. I just had to correct this wrong! Oh, well, oversight anyway. So, here’s the road to recovery. For those of you considering this show, watch it! It’s worth all five seasons, especially if you love a good adventure and love magic. As mentioned above, I got hooked when I saw a preview of these two “Secret Service” agents recruited to hunt magical artifacts. How cool is that? Of course, the first thought that popped into my head was “hey, this is just like that other show on Syfy where they were this government agency kind of like Area 51, but not Area 51 because they were ‘better than those kooks in Area 51’, but I forgot the name of” (and until this day I’m still not sure what show this is, but I’m thinking it was Level 9 because the description and timeline matches. If anyone has an idea of what show I’m talking about, let me know please. I’ve tried to find it. It wasn’t on air long) followed by an immediate second thought that was “or like that movie, The Librarian.” Of course, Warehouse 13 has a flare of its own and I fell in love with it instantly. It starts off with a team of two, Pete and Myka, having that uniquability that draws the attention of the Warehouse. They get recruited as Warehouse agents and thus starts their adventure. Warehouse 13 is a government sanctioned special teams of sorts in which the staff collect and maintain artifacts with magical or otherworldly qualities such as Alice’s mirror which is a prison for Alice because Alice went psycho. Or Icarus’ wings, which imbued the wear the ability to fly. Or HG Wells’ time machine (and spoiler alert, it’s not who you think it is). Along the way, the team expands, but their adventures, at their core, remained the same but stayed interesting and excited. There are so many sub stories and plots you can do with magical objects and these writers do such a good job. But this is my intro, not my farewell, so I’m stopping here to bring you the list of characters. Pete (Eddie McClintock) and Myka (Joanne Kelley) – Team A, and really, you can’t really separate them. They’re inseparable. Claudia (Allison Scagliotti) and Jinks (Aaron Ashmore) – Team B, who really is Team A-2, and you can’t really separate them either. There is one other character who I consider part of the team even though they weren’t always there, and that is HG Wells. They all have their quirks and the chemistry they have together, on screen, is awesome. They really made this show what it is. Stay tuned for my recaps, because you know they’re coming!